I was working one day and Mexican Made Easy came on the TV. Since I work from home, I usually sit in my comfy chair and like to have the TV on for background noise sometimes. Some people don't, but it actually helps me be more productive. Eh, I'm a little weird. Well, I usually don't put on the Food Network because I tend to start watching it for food ideas instead of working like I'm supposed to. I think I've only had that channel on a handful of time over the years for this reason. Well, the other day, I turned it on. Wasn't even thinking. One of Bobby Flay's shows was on (he inspired a drink that I'll be making soon) and Mexican Made Easy came on after that. I'm not huge on Mexican food so I thought I'd be safe keeping that one on. I thought wrong. 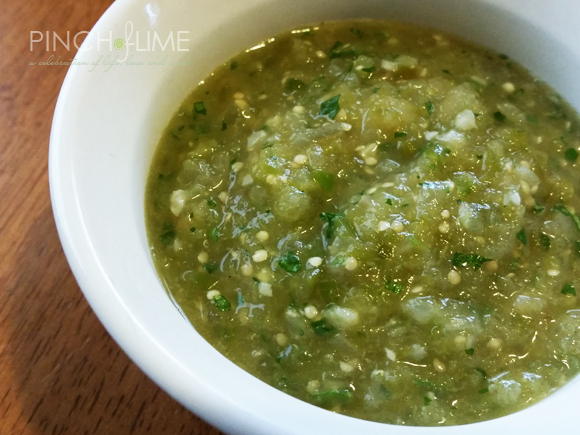 Marcela started making this super easy, delicious looking salsa. And I was very intrigued at her method. It was all being cooked in a pan on the stove top. She just threw everything in there to 'roast' it and give it a nice, earthy flavor. Brilliant. So I took her method and used her recipe as a base for mine. I prefer a little thickness to my salsas so I reworked hers to come up with my own version. It. Is. Awesome. It's a little sweet with a little bit of kick. 1. 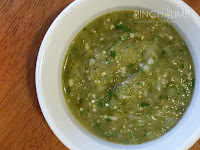 Peel tomatillos and rinse well under warm water. 2. Heat oil in a large skillet over medium heat. Place tomatillos whole into skillet along with garlic, onion, and pepper. 3. Cook for about 30 minutes, turning occasionally, until softened. If they start to char too much before they soften, turn the heat down a little. 4. 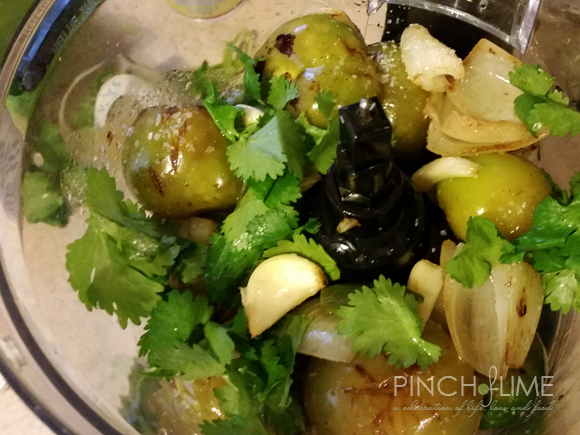 Remove tomatillos and onions as they finish cooking and place into food processor or blender. Peel garlic and add to food processor along with pepper. Add broth, cilantro, and salt. 6. Pulse until you reach your desired consistency.